Welcome to Board Watch for WCCUSD’s April 25th Board of Education meeting at Lovonya DeJean Middle School! 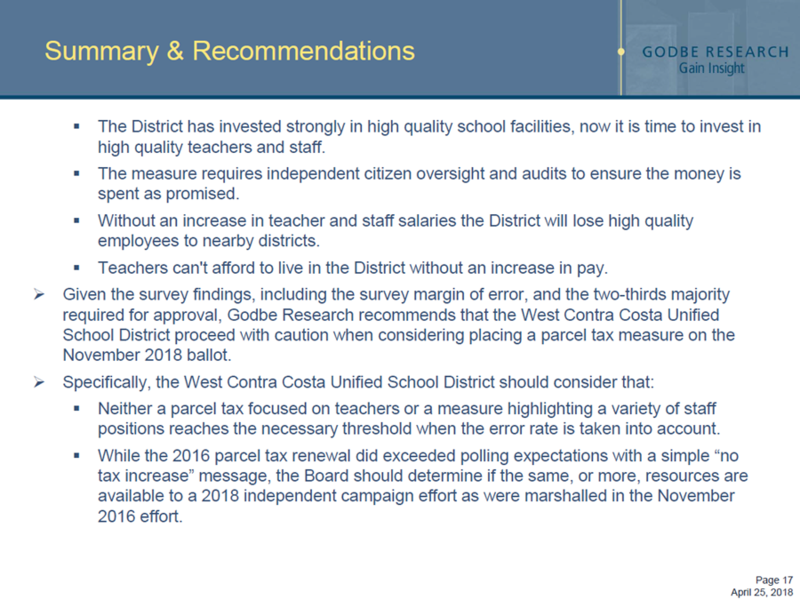 This week, our board members are scheduled to: approve the new position of Chief Academic Officer (CAO) to replace the current position of Associate Superintendent of Pre K-Adult Educational Services; receive and discuss a presentation from District staff regarding School Resource Officer staffing levels and recommended next steps; hear from Godbe Research regarding the results of the parcel tax survey conducted in early April; and hear from Special Education Director Steve Collins about programs, services, data, and student outcomes when it comes to our District’s Special Education Local Plan Area (SELPA). Discussion Item F.1. In November 2017, the Board of Education approved Resolution No. 49-1718: Establishment of a Positive School Climate, which directed the full implementation of Restorative Practices and school-wide Positive Behavior Interventions and Supports at all school, tiers of interventions and alternatives to school suspension, and the establishment of a clear policy and implementation plan to re-evaluate the roles, duties, functions and practices of law enforcement in our schools. The resolution also called for Superintendent Duffy to collect data on School Resource Officer staffing levels, calls for service, arrests and alternative practices in place at schools. In addition, the Superintendent was tasked with presenting a set of recommendations regarding appropriate levels of police staffing. This agenda item gives the Board and the public an opportunity to discuss the resolution and recommendations. The board may choose to accept the options presented or make its own determination on this matter. If directed by the Board, SRO staffing will be placed on the agenda for the May 2 Board of Education meeting. 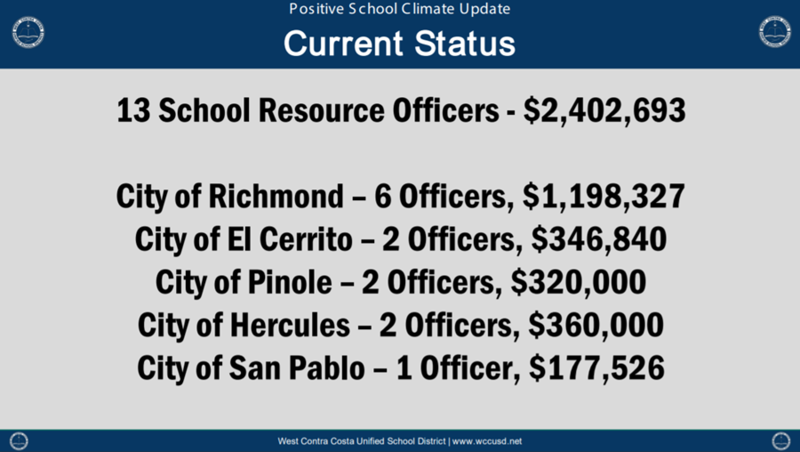 Option 1: No change to the current SRO staffing levels. 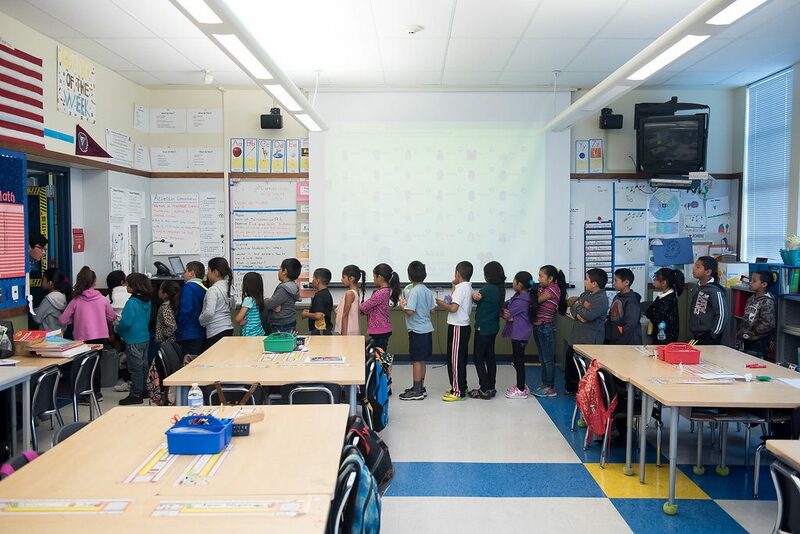 In order to better support positive school climate initiatives, move to a 50-50 cost-sharing model in the 2019-20 school year. Option 2: No change to current SRO staffing levels; move to 50-50 cost-sharing in 2020-21. Option 3: No change in SRO staffing levels for 2018-19 and 2019-20. Beginning in 2020-21, assign one SRO to each comprehensive and continuation high school. Assign one SRO to Helms Middle School to maintain the City of San Pablo’s presence in the program and ensure the schools in that city have a dedicated law enforcement contact. Under this option, the cost of SROs would be shared 50-50 with the cities beginning in the 2020-21 school year. If the Board chooses Option 3, it is recommended that the cost of contracts for SROs be reduced by 5 percent in 2018-19 school year and by 10 percent in the 2019-20 school year. This would result in an estimated savings of $120,000 in the first year and $240,000 in the second. Click here to view the District’s School Resource Officer Recommendation Memo. Discussion Item F.2. Back in February, our Board of Education discussed placing on the ballot a parcel tax to support teacher / staff compensation. After discussion, District staff were directed by the Board to conduct a survey of voters to gauge the community’s potential support for such a measure, and also to meet other objectives such as understanding which projects and programs should be funded with the revenue from the parcel tax. 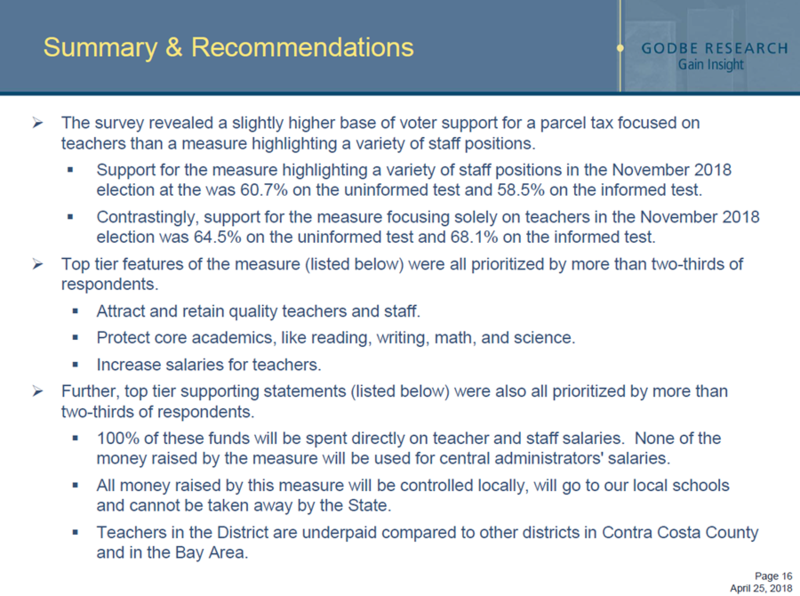 District staff contracted with Godbe Research who conducted the survey in early April. At this meeting, Bryan Godbe is scheduled to present the results from that survey. Discussion Item F.3. WCCUSD is a single district Special Education Local Plan Area (SELPA) serving 4,128 students between the ages of 0-22 in a variety of programs. This overview will include current WCCUSD SELPA statistics, services, programs and the latest data on special education services in our community. 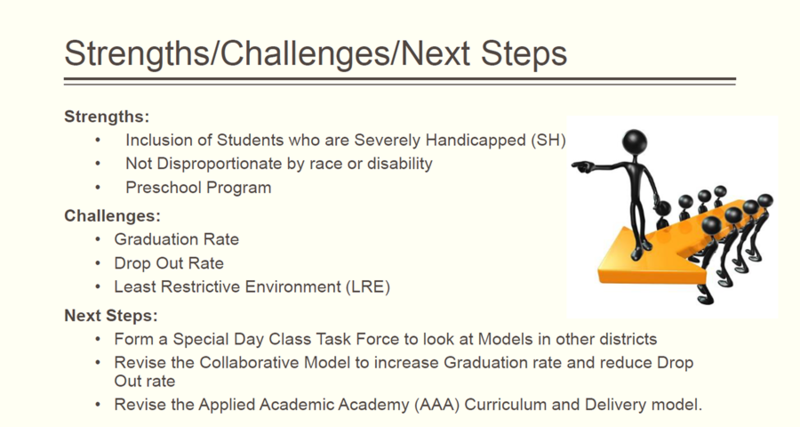 Below is a slide from the presentation regarding strengths, challenges, and next steps to better support students.